There’s an inherent flaw in solar cells: the metal wiring that’s quintessential to harnessing the electrons reflects the incoming light, acting like a mirror. Now, must people would brush off this issue and leave it like that. It’s a necessary trade off. But a team at Stanford University devised an elegant chemical technique that basically hides the wiring with silicon, away from the light while preserving energy harnessing. Metal wires cover 5 to 10 percent of a solar cell’s surface. Now, in the same area more light can be absorbed, hence more electricity generated which jumps the efficiency. Of course, this also means cheaper solar panels — if only the chemical technique is covered by the recurring costs of increased efficiency. The researchers modeled a typical solar cell with a thin film of gold 16-nanometer-thick atop a flat sheet of silicon. Tiny, itsy bitsy holes were perforated on the whole surface, but to the naked eye the gold layered object still looked like a shiny mirror. Analysis showed the hole-ridden gold film covered 65% of the silicon’s surface, reflecting 50% of the incoming light. So far so good. That was predictable. A typical solar cell – wiring is both on top and back. The metal contacts still work great. 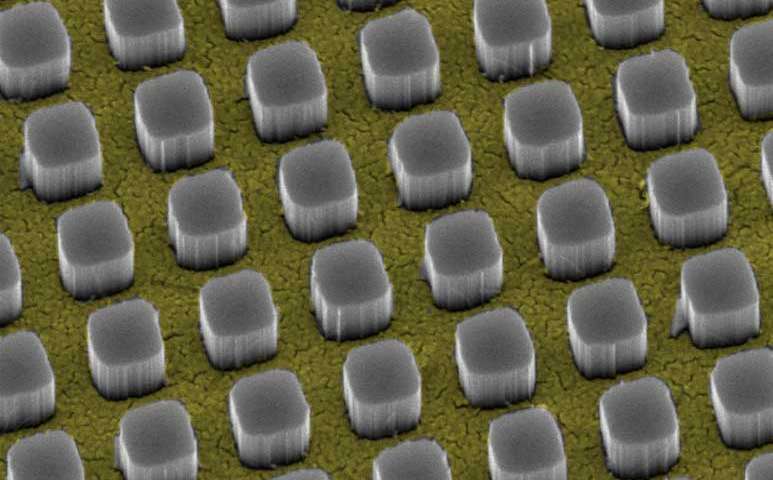 Through trial and error, the Stanford researchers eventually reached an optimal design where nearly two-thirds of the surface can be covered with metal, yet the reflection loss is only 3 percent. This not only means that manufacturers can hide metal contacts – they can include more of it since it helps with efficiency! The researchers estimate a conventional 20% solar panel can up its efficiency to 22%, a huge gain. Multiply that by millions of solar panels and you’ve got a massive energy gain and cost reduction. A model gold sheet is, of course, different from an actual solar cell. Looking forward to seeing this work applied to an actual working cell.